Quick overview Speaker System Z313 features a convenient control pod, room-filling sound, compact subwoofer, and easy setup. The control pod makes it easy to control volume and headphone controls. You can fill your room with big, balanced sound (25 watts). The compact subwoofer fits into tight spaces and delivers deeper bass. 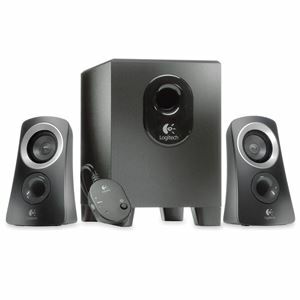 To set up, simply connect the speakers to the subwoofer and plug the subwoofer into your computer. Total RMS power is 25 watts (RMS). Frequency response is 48 Hz to 20 kHz (+/- 3dB). The subwoofer measures 8-2/3" wide x 6" long x 9" high (22cm x 15cm by 22-4/5cm). Each satellite measures 3-1/4" wide x 3-1/2" long x 5-3/4" high (8-1/10cm x 8-9/10cm x 14-2/3cm).